Share the post "Financial Tips to Last a Lifetime Shared at Workshop for Rutgers Students"
Barbara O’Neill, distinguished professor and extension specialist in Financial Resource Management, was named a fellow of Next Gen Personal Finance after attending their 2017 Summer Institute for financial educators. Each NGPF fellow was given a $1,000 grant by NGPF founder Tim Ranzetta to deliver a financial education program where they work. 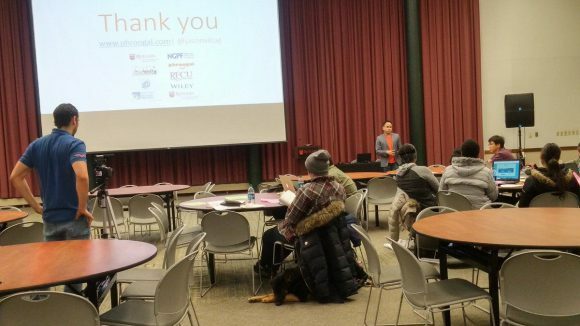 On April 3, O’Neill and a committee of passionate New Jersey financial educators held a program for Rutgers University students called R U Financially Fit (RUFF)? RUFF began with pizza and exhibits by 10 organizations involved in financial education: Affinity Federal Credit Union, Navicore Solutions, NJ Higher Education Student Assistance Authority (HESAA), NJ Coalition for Financial Education (NJCFE), Next Gen Personal Finance, Phroogal, Rutgers Cooperative Extension, Rutgers Federal Credit Union, Rutgers University Office of Financial Aid, and Wiley Publishing. Students playing the online simulation game Payback. 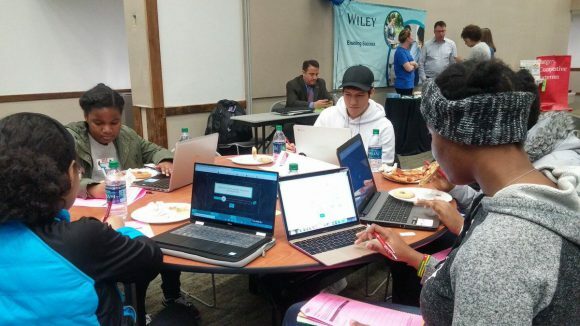 Students played the online simulation game Payback, which provides feedback about decisions that college students make from selecting a college through earning a degree. Payback tracks student loan debt and three intangible factors: focus, connections, and happiness. In a debriefing of the game, students noted that it was difficult to balance the three factors and that student loan debt will likely affect their life after college. Keynote speaker Jason Vitug, founder of Phroogal. 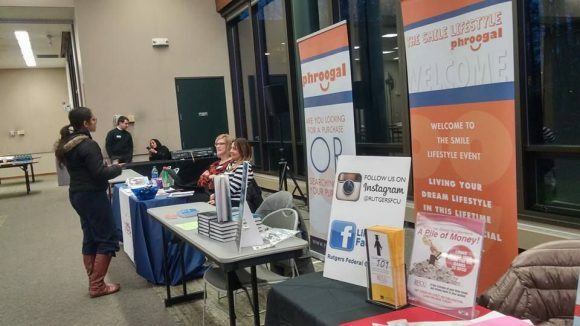 Keynote speaker Jason Vitug, the founder of Phroogal, spoke about financial wellness. In his presentation, he encouraged students to beware of lifestyle inflation, trade-offs between working long hours to earn more money, and to follow the ACT process: Awareness, Create a Plan, and Take Control. Specific suggestions included: starting an emergency fund, automating finances, reducing one expense, and saving spare change. Samantha Benson from HESAA spoke about college costs, financial aid, and the FAFSA form required to obtain aid. Key take-aways were the wide variety of state and federal financial aid programs available and students’ responsibility to respond to document requests. NJCFE executive director, Michael Drulis, speaking about his path as an entrepreneur, noted that “passion is the difference between having a job or a career.” Currently enrolled in a Master’s degree program, he also noted that education is lifelong and that no one is too old to pursue additional educational credentials. O’Neill urged students in her Ignite presentation not to make a “$1 million mistake” by delaying retirement savings from their 20s to their 30s or beyond. She reminded them that compound interest is not retroactive! The most valuable savings that students will have is savings in their 20s that has 4-5 decades to grow. Multiple financial goals (e.g., repaying student loan debt, saving for a house, and retirement savings) can be saved for concurrently. Read this and many other article’s at Barbara O’Neill’s blogspot.